Sarnia-Lambton offers beautiful routes and destinations for beginner to advanced cyclists. On road routes and off-road trails link cyclists to amazing waterfront views, historical sites and the beauty of nature. Sarnia-Lambton is an ideal location to plan cross border routes, with 2 ferry locations available to transport cyclists from Canada to the US. Please contact us if you would like to share information about cycle routes or groups in Sarnia-Lambton. 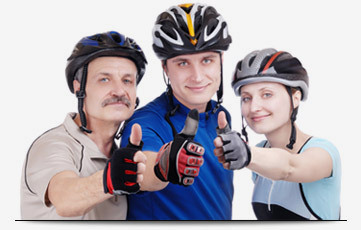 This section links cyclists to mapping websites and local routes in Lambton County. We also encourage cyclists to save and/or recommend some of their preferred routes on one of the mapping sites. This link highlights the 15 km bike-friendly signed route within the City of Sarnia. The streets shown connect downtown Sarnia to major access ways in Sarnia including Maria St to Bluewater Health, Lochiel/Cameron (downtown Sarnia) to Wellington Path to YMCA, Lambton College & Lambton Mall, MacKenzie as a safe N/S route to join parts of the city and Nelson connects downtown to N/S route and Northgate area. The Trees of Distinction Tour is brought to you by the Community Round Table Environment Committee, Arbour Week Committee and Bike Month Committee. It is a 21 km round trip that begins at City Hall and finishes in beautiful Sarnia Centennial Park. The route highlights 17 unique tree species located throughout the City of Sarnia. The Lambton Trails website allows for ease of use and fast map navigation similar to Google Maps. The tools provided allow users the ability to search for all trails, within trail communities and search by trail activity. For those users with Google Earth installed, there is an option to open the trails data in Google Earth to further explore the trails in and around Lambton County. Trail information includes a description of the trial or trail network, pictures of the trail and links to the associated organizations responsible for trail maintenance and management. Bikemap is one of the largest collections of bike routes on the web. Cycle routes can be mapped or uploaded from GPS devices with this useful mapping tool. New program to be launched in May 2013! If your bike has been collecting dust in the garage and/or you lack the confidence to ride on the road, then this program is perfect for you. Join a certified Can Bike cyclist as they teach you basic tips and tricks to get you riding safely again. Join us for guided beginner tours and learn the skills you need to become a confident cyclist once again. For a list of bike friendly businesses in Lambton County, or to apply to become a bike friendly business, please visit the Lambton County Trails website. A growing number of hikers, walkers, and cyclists are visiting Lambton County to enjoy more than 100 kilometres of off-road recreational trails. For health, pleasure, relaxation, and sheer natural beauty, Lambton County has trails of every description including boardwalks, waterfront walks, rail trails and foot paths. Welcome to Bluewater Trails. We have a growing network of pathways throughout Sarnia and Point Edward. We invite you to cycle, walk and hike your trails regularly. The Lambton County Regional Trail Committee is a group of people representing various County of Lambton organizations with an interest in Active Living. Their purpose is to promote healthy living through the promotion of trails and natural areas and to encourage their use in hiking, cycling and other physical activity. Our committee also hopes to preserve our open spaces and to connect our communities through our trail systems. Enjoy the St.Clair River Trail stretching 35 km from LaSalle Line north of Corunna, south along the scenic St.Clair River to Port Lambton along the western boundary of Lambton County. Groups meet on Tuesday & Thursday evenings and Saturdays mornings at Michigan Avenue & Blackwell Road. 30-40km group rides for all levels usually scheduled on Wednesday evening (call or check website for exact times, schedule, etc.). Departing from, and returning to, Blackwell Cycle at 1801 Blackwell Rd. Occasional evening 'coffee rides' (year-round) via the Howard Watson Trail. Check our website for latest ride info. The Lambton Outdoor Club (LOC) is a non-profit organization that offers its members the following activities; cycling, hiking, canoeing/kayaking, XC skiing, winter outings and social events. The Bridge to Bay Trail is a nearly complete 54 mile paved trail system in St. Clair County. It is a popular recreational trail enjoyed by both residents and tourists for walking, running, biking and rollerblading. Canada has some terrific destinations for bicycle touring whether for one day or a week or more. It's wide open spaces are crisscrossed by a variety of roads and bike trails. However, roads in some areas may have too much traffic and lack paved shoulders to make for pleasant cycling. Proud to be serving Sarnia and Area for over 22 years. Our customer service, great products and friendly staff is what keeps you coming back. We love to ride so check out our website and like us on facebook to see what we can do for you. Sarnia-Lambton's best and widest selection of bicycle brands - whether for road, trail, commuting, touring, or just cruising around having fun - combined with knowledgeable and objective sales advice, expert bicycle service and repair, and a complete range of bicycle clothing, parts, and accessories makes Blackwell Cycle the preferred destination for area cyclists. 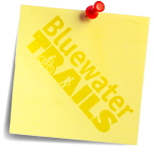 The Bluewater Trails Committee offers community event organizers and businesses the use of bicycle racks to encourage their patrons to get more active and ride their bikes to events and festivals, reduce traffic congestion and reduce vehicle emissions. This manual is a guide to instruct event organizers how to safely set-up the bike rack system to provide a convenient, accessible, safe and economical method to park many bikes in a small area. Sarnia Transit busses are equipped with a bike rack on the front bumper. This brochure provides instructions for loading and securing bikes to the racks.